Kyphi essential oils, kyphi, egyptian essential oils, essential oils, egyptian, egyptian fragrances, egyptian oils, wholesale essential oils, aceites esenciales egipcios, aceites esenciales, esencias, esencias egipcias. The Kyphi essential oil is one of the sacred oils of Ancient Egypt. It uses the authentic Kyphi formula used by the ancient Egyptians. 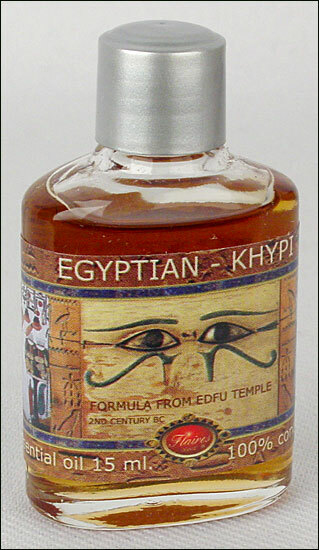 Kyphi was the most popular oil used in Ancient Egypt. It was used in the temples as well as in the households. Very high quality essential oil made in Spain by Flaires using high quality 100 % concentration Egyptian essential oils. 15ml bottle (0.5oz).